Nationwide on AT&T GSM Network. To load PIN beginning with "30104-", please call 1-800-403-7801 and follow the instructions OR follow the *888* loading instuctions above to load the PIN using your GoPhone. For TDMA phones: PRESS #20 + (PIN number) + # + SEND. If you are a new AT&T GoPhone Customer and have never used your phone before, you need to activate your phone by calling 1-877-426-0525 . AT&T GoPhone has three different plans to fit your budget! AT&T refill PINs will be applied to your account based on the plan you are curently enrolled in. Dial 611 to verify or update your prepaid plan. 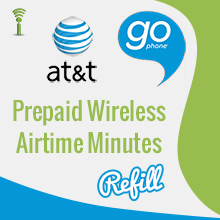 AT&T GoPhoneRefill Minutes: Compatible with all AT&T GoPhone PAY AS YOU GO Prepaid Wireless plans. If you are uncertain as to what type of AT&T GoPhone Refill Minutes Plan you may have, please call our professionally trained customer service representatives toll-free at 1-877-6-Get-PIN (1-877-643-8746) from 10am to 10pm EST 7 days a week or visit our Wireless Prepaid FAQ section or Email us at [email protected]. For GSM phones: PRESS *888* + (PIN Number) + # + SEND. Or, dial 611 (or 1-800-901-9878) from your wireless phone - a free call. Follow the instructions to add this card value to your account. You can also use 611 to check your account balance. If you are a new AT&T Go Phone customer and have never used your phone before, you need to activate your phone by calling 1-877-426-0525. The AT&T GoPhone® logo and the AT&T GoPhone® product images are registered trademarks of AT&T GoPhone®. CallingMart is in no way affiliated with AT&T GoPhone® or any other entity for which a logo or name may be present. CallingMart refers to these logos and or names solely for the purpose of demonstrating the products and or services that it resells.